Overview: Goa during monsoons is different then its normally imagined. Less touristy, green all around, deserted beaches. For experiencing a part of Konkan railway, we took the Bangalore City-Karwar express, covering the best of nature between Mangalore to Karwar on the Konkan line. Green fields, misty mountains and massive backwaters and rivers greeted us on the way. After reaching Madgaon late in the afternoon, we checked into our hotel near Colva beach. We spent the evening by the beach watching the beautiful sunset, and planning for the rest of the trip. We started early next morning, starting with Safa Masjid, built in 1560 by Ibrahim Adil Shah in Ponda. This is a small single chambered mosque with tiled roof having a flight of steps in the front entrance. To the south of the mosque, there is a 600 sqm water tank with Mihrab designs. The tank has a natural spring which keeps it filled with water throughout the year. This place is not to be missed while in Ponda. 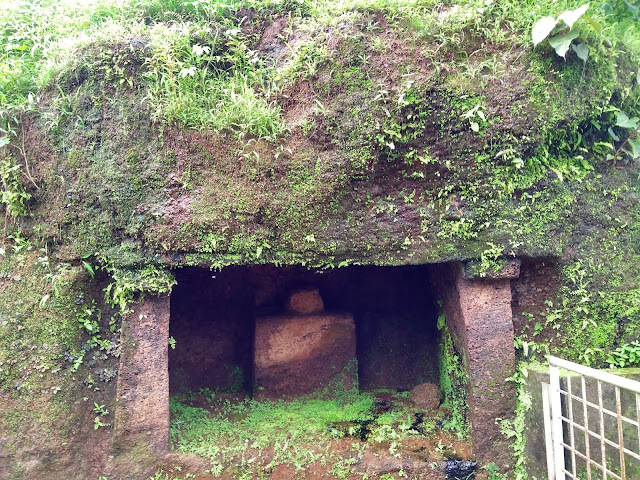 We next proceeded towards the Pandava caves, which lies on the banks of the Mahadayi river. There were 5 caves, with nothing inside them. These caves are also believed to be Buddhist caves acting as a place of meditation. The place lies in the middle of nowhere, with only the sounds of birds and nature. Our next destination was the Mahadeva temple at Tambdi Surla. The temple lies in the interior jungles of Molem wildlife sanctuary. The approach road is stunningly beautiful with dense forests and waterfalls all the way. The temple is facing east and stands on a simple moulded plinth. It consists of garbhagriha, a pillared mukhamantapa where the Nandi is seated. The temple reflects the later Chalukyan and Hoysala architecture, and a Kadamba shikhara, dating back to 13th century. Near the temple is the trail which leads to the Tambdi Surla waterfalls. Next we headed towards Salaulim Dam, but before that on the way we saw a board showing us directions to some heritage site near Shigaon. We decided to walk down the path and explore the site. To our disappointment, it was just a small cave, with nothing worth capturing from inside. We then proceeded towards the dam. There is an entry fee of Rs 15 to visit the dam, and can be reached by a flight of steps. The dam is worth seeing, and the semi-circular plunge for the waters is something unique which was a spectacle. We thought of having our lunch near the dam but unfortunately there is no proper restaurant nearby. We finally had pizza at Sanguem for lunch. Next, we reached Usgalimal Rock engravings, known as petroglyphs, which were carved by prehistoric men around 20000 years ago. The engravings are very clear and images of animals and some wierd circular patterns can be identified. These engravings are found on the banks of the river Kushavati. Apart from the prehistoric site, the place is ideal to spend some time amist nature and clear waters of the river. 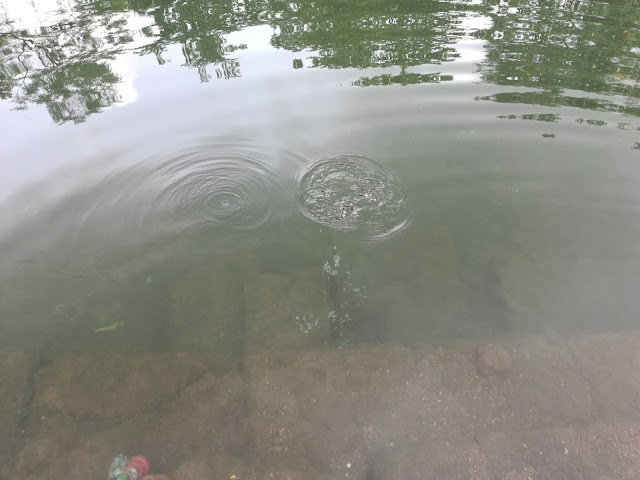 From here we headed towards Netravali Bubbling lake, tucked in the middle of spice plantations, a strange phenomenon where one can witness bubbles from beneath the surface of the water. One can keep observing the lake and can see bubbles forming and moving upwards, something which is unusual. Its a nice place to spend an hour or so in silence. This lake is actually a stepwell, built during the medieval period, and a temple dedicated to Lord Krishna stands next to the stepwell. We then headed towards Agonda beach, where one can see wierd rock formations on the western side of the beach. As it was monsoon and dark clouds were forming in the horizon, we couldn't see too many people on the beach. Cool evening breeze made things even better for us and we spent some good time admiring the little rough sea. From here, we went 18km northwards to Cabo de Rama fort, a pristine fort in South Goa, offering panoramic views of the coastline along the Arabian sea. This fort was originally built by a Hindu king, followed by the Muslim rulers before being captured by the Portuguese. This fort is currently in ruins, but serves as a perfect place to unwind for the day. Awesome. Have noted down these beautiful places for my next trip to India. Lovely post. Goa is gorgeous during the monsoon. A well preserved old temple made of stone.. Along-with the temple, the surrounding and drive to the place is awesome..